This user has been on UESPWiki for 3 years, 8 months, and 26 days. This user scored 50580 points on the UESPholic Test. This user is knowledgeable about Skyrim Creation Club. This user is knowledgeable about Skyrim Very Special Edition. I am an administrator on the wiki, and can be contacted through Discord, my talk page, or email (preferably in that order). I have a bot called CyrusBot to make large numbers of repetitive edits automatically. You can make a bot request on the Bot Requests page or ask on Discord. The main administrative tool I use is surprisingly moving pages without leaving a redirect, and a close second to that is deleting pages (usually unnecessary redirects). As a patroller, I do my best to check edits for accuracy and format, particularly outside the Online and Legends namespaces. As an editor, I've made contributions throughout the wiki to varying degrees. 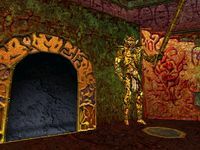 The first big project I attempted was overhauling the Redguard namespace to bring it up to current standards, and those are perhaps my best edits even now. I am currently working on Tamriel Rebuilt and Project Tamriel documentation, which so far has involved a lot of moving pages to split Tamriel_Data into its own subspace of Tes3Mod. Most content for Tamriel Rebuilt following the release of Antediluvian Secrets is missing, and nearly all for Skyrim: Home of the Nords and Province: Cyrodiil. My other edits are primarily correcting grammar, spelling, and general maintenance like fixing templates. I was introduced to the Elder Scrolls through Oblivion, and ever since then I've had a great interest in the games and lore. Computer Science and Mathematics are my favorite academic subjects, and I know Java and Python fairly well. I also enjoy the works of J. R. R. Tolkien, though I have much left to read and reread. I also have accounts on Wikipedia and Tolkien Gateway with the same username. Books by Length: A list of lore books in order of word count. UESP Achievements: A quiz similar to the UESPholic Test. Tamriel Rebuilt / Project Tamriel: Have contributed a few interiors, quests, writing, and other miscellaneous assets and plan to continue doing so. This mod adds content from Dawnguard, Hearthfire, and Dragonborn to the world through leveled lists, merchants, and manual placement of objects. Its purpose is to incorporate the DLC into the base game in ways that make sense, but were left out for various reasons. I made the two maps below using various official maps from the Elder Scrolls series. The one on the left is notable because it shows all locations on the map of West Tamriel in readable form. The names were determined through Redguard's loading screens and box art. 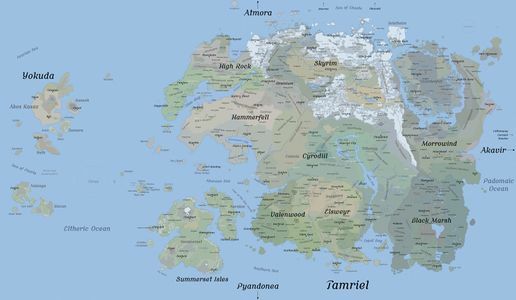 The map on the right is based primarily on the Elder Scrolls Anthology map, along with the West Tamriel map and maps from Arena through ESO. 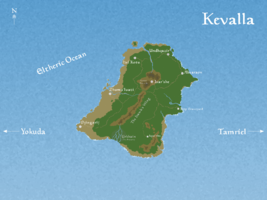 This map is a non-canon depiction of the island of Kevalla, located in the Eltheric Ocean between Yokuda and Tamriel. 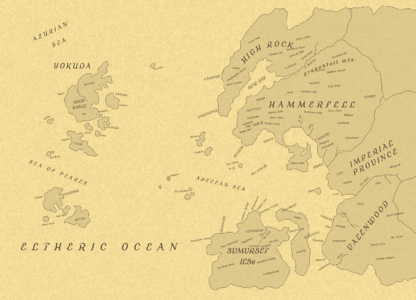 The only source for this place is the West Tamriel map, so except for the general shape the geography is entirely made up. Credit to Nirn is Flat on Discord for the idea and names. This page was last modified on 28 February 2019, at 09:42.